The Tools of a Learned Ministry | When I Survey . . . I love books. I come by it honestly since I am the child of librarians. My mother had a library degree from Columbia and over the years worked successively at the New York Public Library, the General Theological Seminary, and the Wandell Middle School in Saddle River, New Jersey. My father, who was somewhat of a vocational dilettante, also had a library degree from Columbia and worked for a time at the General Theological Seminary. My mother’s 89 year old sister Grace, whom we call Aunt Tia, is also a librarian and just recently retired from running the library at her retirement community in Sun City, Arizona. My big sister has a library degree from Rutgers and is an archivist at the John F. Kennedy library in Boston. I like to say that I am the black sheep in the family, because I went into the ministry. I grew up around books. Other families had wallpaper, we had shelves of books covering our walls.In the summers I spent countless hours at my mother’s school library in the stacks, finding treasures to read. I thought every family went to the public library on Saturday mornings to get their books for the week. As a young adult I came back to the Christian faith largely through books. I met several of my guides and mentors only through books:Thomas Merton, C.S. Lewis, Dorothy Day, Abraham Heschel, Reinhold Niebuhr, Karl Barth, P.T. Forsyth, Flannery O’Connor, Graham Greene, Frederick Buechner, to name but a few. In the pages of their books it seemed that God was real and alive, and so he became for me.They sent me back to the Book where the story behind all their stories is told. When I am in a discussion I usually have a book to recommend, and, consequently, I have been accused of holding to a belief in “salvation by bibliography.” I plead, at least in part, guilty. When I entered ministry I was delighted to be in a profession among whose tools were books. I recall going into pastor’s studies and just staring at the books.Look at all the books! 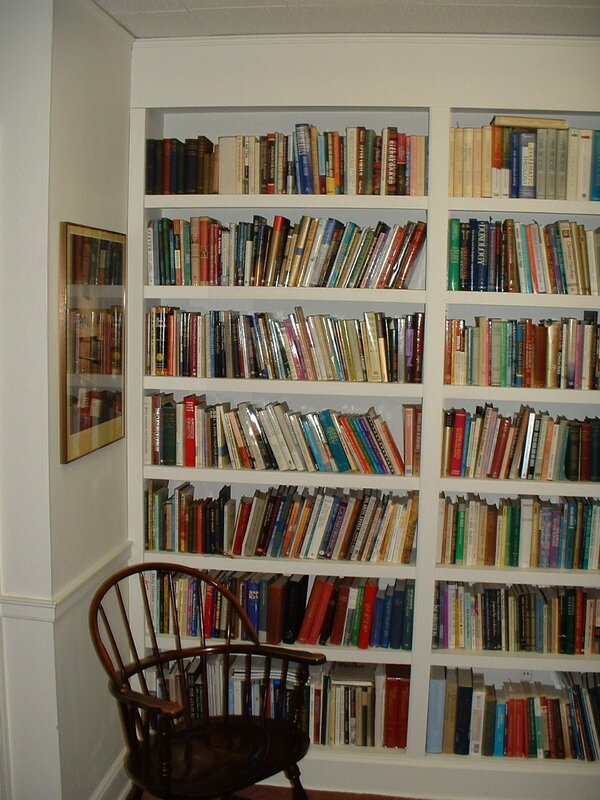 Shelves of commentaries, big reference works, multi-volume works of theology. I couldn’t believe anybody could be so blessed as to work in a room surrounded by all those books. Not just to read, but to touch and look at, for books have a kind of talismanic power just by their presence in a room. In seminary we young theologs used to love to visit pastors and admire and covet their books. Was it too much to hope that someday we would have books like that? Well,it has taken twenty-five years, but now I am one of those pastors. I have a whole roomful of books. Fred Buechner calls his library “The Magic Kingdom,” and that is how I feel about mine.I have accumulated my many books over the years, writing my name and the year of purchase in the flyleaf, and so they are a record of my interests over time. They tell a story. For example, at some point I stopped buying ministerial “how to” books because I guess I felt I knew “how to.” I went through a Henry Nouwen stage and then suddenly in the 80’s,it stopped. I have a stack of books on the arms race from the late seventies. I have at least one commentary on every book of the Bible. I have old books from the eighteenth and nineteenth and twentieth centuries. I have a Shaker Bible given to me by an antique dealer in my first church.I have an antique copy of Foxe’s Book of Martyrs that belonged to a friend’s grandfather, a minister of the Free Church of Scotland in the 19th century. I have books of poetry and prayers, dictionaries, handbooks, worshipbooks and novels. I’ve noticed a strange thing over the last few years. During that time I have been privileged to know and work with a number of young clergy and seminarians, men and women. Most of them are gifted, hard–working, dedicated and capable. There is a lot to like about them. But one thing is noticeably missing.They don’t love my books.They don’t stare at them, or touch them, or covet them.They don’t even notice them when they come into my study. They are more likely to notice and comment on my computer. This worries me. Can the church maintain a “learned clergy” without instilling a love of books? Is it possible that books are really passé as some say? That in the future the digital age will restrict if not eliminate their use? I hope not. Because books are more than mere information. Throughout my life they have always been my companions and friends. They can invoke wonder and create mystery. They can witness to faith. They are grist for my sermonic mill. But they are more than that. They fuel not just my work but my imagination. I wouldn’t be the minister I am without them. I wouldn’t be who I am without them. This entry was posted in Colleague, libraries, ministry. Bookmark the permalink. ← >Is Digital the New Normal? >If your mother was the Mrs. Floyd who was the Wandell librarian in the '60s, I remember her! She was wonderful. In fact, I use FLOYD as a password on book-related websites (what greater homage?). >Thank you so much for this comment. My Mom was the librarian at Wandell School in the sixties. She had to leave for health reasons, and died too young at age 53 in 1967, the year I graduated from High School. Never expected to hear from someone who remembered her.